Watch an animated about nutrition, with lots of facts about food. Includes simple recipes for healthy snacks and burgers, ideas for taking more exercise and information on food labels, advertising and how food is grown. Written in a clear, factual style with bright, stylish illustrations and internet links to recommended websites to find out more. The importance of healthy and balanced eating for a healthy lifestyle is now part of the UK National Curriculum for Personal, Social and Health Education (PSHE). This formative guide is clear, simple and factual, without being preachy. 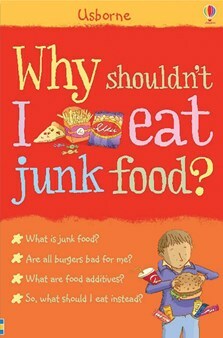 It is a good way to introduce children to the reasons why healthy eating is so important. Topics, such as food groups, processed food, the importance of exercise, Fairtrade, organic food and genetically modified food are all handled in a conversational style. With easy step-by-step recipes and alternative lunch box suggestions, accompanied by vibrant illustrations, this book is sure to be a hit with parents, teachers and children.